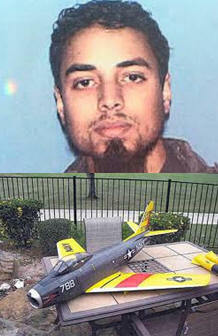 November 28, 2011 - Rezwan Ferdaus, a 26-year-old U.S. citizen from Massachusetts accused of plotting to attack U.S. government buildings using explosives-laden remote-control model aircraft was ordered today held without bail on Monday by Federal Judge Timothy Hillman, who ruled he was an "intelligent and troubled young man" that was committed to his cause and a danger. Judge Timothy Hillman wrote in his ruling "Simply put, what makes Ferdaus a significant danger to the community is not whether his plan would have worked or whether he had the means to implement it, but that it was his strong desire to see his plan carried out." Ferdaus was arrested and charged in connection with his plot to destroy the Pentagon and U.S. Capitol, using large remote controlled aircraft filled with C-4 plastic explosives in September. Rezwan Ferdaus, a U.S. citizen, was also charged with attempting to provide material support and resources to a foreign terrorist organization, specifically to al Qaeda, in order to carry out attacks on U.S. soldiers stationed overseas. ?Our top priority is to protect our nation from terrorism and national security threats. The conduct alleged shows that Mr. Ferdaus had long planned to commit violent acts against our country, including attacks on the Pentagon and our nation?s Capitol. Thanks to the diligence of the FBI and our many other law enforcement partners, that plan was thwarted,? said U.S. Attorney Carmen M. Ortiz. ?I want the public to understand that Mr. Ferdaus? conduct, as alleged in the complaint, is not reflective of a particular culture, community, or religion,? she added. ?In addition to protecting our citizens from the threats and violence alleged, we also have an obligation to protect members of every community, race, and religion against violence and other unlawful conduct.? The public was never in danger from the explosive devices, which were controlled by undercover FBI employees (UCs). The defendant was closely monitored as his alleged plot developed and the UCs were in frequent contact with him. Richard DesLauriers, Special Agent in Charge of the FBI?s Boston Division said, ?The FBI used an undercover operation to conduct this investigation. Undercover operations are used to combat all types of crimes and criminals, including in the counterterrorism arena.? The arrest affidavit alleges Ferdaus, a Northeastern University graduate with a degree in physics, began planning to commit a violent ?jihad? against the U.S. in early 2010. He obtained mobile phones, each of which he modified to act as an electrical switch for an IED. He then supplied the phones to FBI UCs, who he believed to be members of, or recruiters for, al Qaeda. According to the affidavit, Ferdaus believed that the devices would be used to kill American soldiers overseas. During a June 2011 meeting, he appeared gratified when he was told that his first phone detonation device had killed three U.S. soldiers and injured four or five others in Iraq. Ferdaus responded, ?That was exactly what I wanted.? According to the affidavit, after each subsequent delivery, Ferdaus was anxious to know how well each of his detonation devices had worked and how many Americans they had killed. During recorded conversations, Ferdaus stated that he devised the idea of attacking the Pentagon long before he met with the government?s cooperating witness (CW) and UC, and that his jihad had, ?started last year.? In recorded conversations with the CW that began in January 2011, Ferdaus stated that he planned to attack the Pentagon using aircraft similar to ?small drone airplanes? filled with explosives and guided by GPS equipment. According to the affidavit, in April 2011, Ferdaus expanded his plan to include an attack on the U.S. Capitol. In May and June 2011, Ferdaus delivered two thumb drives to the UCs, which contained detailed attack plans with step-by-step instructions as to how he planned to attack the Pentagon and Capitol. The plans included using three remote controlled aircraft and six people, including himself, whom he described as an ?amir,? i.e., an Arabic term meaning leader. During various recorded meetings, Ferdaus envisioned causing a large ?psychological? impact by killing Americans, including women and children, who he referred to as ?enemies of Allah.? According to the affidavit, Ferdaus? desire to attack the United States is so strong that he confided, ?I just can?t stop; there is no other choice for me.? ...with this aerial assault, we can effectively eliminate key locations of the P-building then we can add to it in order to take out everything else and leave one area only as a squeeze where the individuals will be isolated, they?ll be vulnerable and we can dominate. Once isolated, Ferdaus planned to ?open up on them? and ?keep firing? to create ?chaos? and ?take out? everyone. He also provided the expanded plan to the UC on a thumb drive. Between May and September 2011, Ferdaus researched, ordered and acquired the necessary components for his attack plans, including one remote controlled aircraft (F-86 Sabre). Prior to his arrest, Ferdaus received from the UCs 25 pounds of (what he believed to be) C-4 explosives, six fully-automatic AK-47 assault rifles (machine guns) and grenades. In June 2011, Ferdaus rented a storage facility in Framingham, Mass., under a false name, to use to build his attack planes and maintain all his equipment. According to the affidavit, in August 2011, the F-86 remote controlled aircraft was delivered to the Framingham storage facility. Ferdaus delivered a total of eight detonation devices to the UCs over the course of the investigation, which he built with the intention that they be used by al Qaeda operatives overseas to kill U.S. soldiers. On September 20, 2011 Ferdaus made a training video, which he provided to the UCs, demonstrating how to make ?cell phone detonators.? According to the affidavit, at the meeting the UCs allowed Ferdaus to inspect the explosives and firearms (a quantity of C-4 explosives, three grenades, and six fully-automatic AK-47 assault rifles) that the UCs delivered, and that Ferdaus had requested for his attack plan. After inspecting the components, Ferdaus brought them to his storage unit, took possession of the explosives and firearms, and locked them in his storage unit. Ferdaus was then immediately arrested. Although Ferdaus was presented with multiple opportunities to back out of his plan, including, being told that his attack would likely kill women and children, the affidavit alleges that Ferdaus never wavered in his desire to carry out the attacks. If convicted, Ferdaus faces up to 15 years in prison on the material support and resources to a foreign terrorist organization charge; up to 20 years in prison on the charge of attempting to destroy national defense premises; and a five-year minimum mandatory in prison and up to 20 years on the charge of attempting to damage and destroy buildings that are owned by the United States, by using an explosive. On each charge Ferdaus also faces up to three years of supervised release and a $250,000 fine.